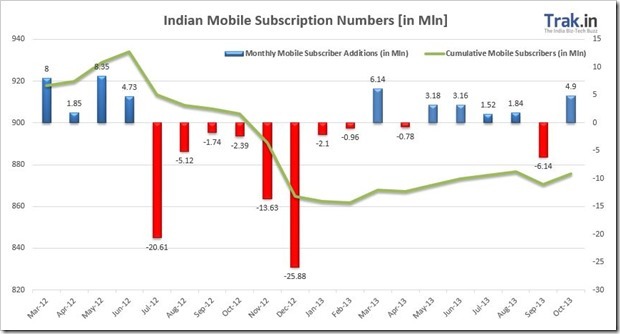 Close to 5 million new mobile subscribers were added in the month of October 2013 as per the latest TRAI report. In month of September, India saw a drop of over 6 mln subscribers, primarily due to Reliance deactivating around 10.5 million numbers from their network. This is also the largest mobile subscriber addition since March of this year, when 6.14 mln were added. Another trend that has been seen over past 6 months has been that rural India is now consistently outpacing the urban subscriber addition growth. Rural India added 2.9 million new connections as compared to 2 mln in urban areas. For the first time, the active mobile subscriber percentage has gone over 85 percent. Nearly all telecom operators now remove numbers from their network, if there is no activity on a number for more than 3 months. Over past 2 years, the percentage has grown from early seventies to now crossing 85 percent. – With an increase of 4.9 million in oct 2013, total mobile subscriber base has reached to 875.48 million. 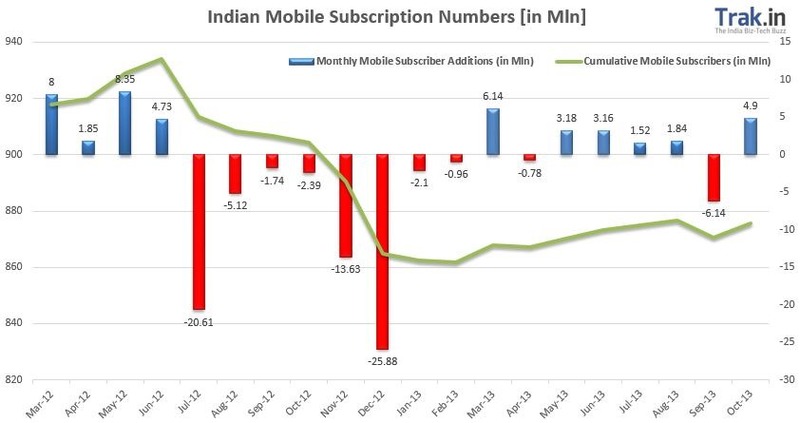 India had 870.48 million subscribers by end of September 2013. – Urban India witnessed a increase of 0.38 percent or 2.00 mln subscribers, while rural mobile subscriber base increased by 0.83 percent or 2.90 mln. – Urban Teledensity decreased to 138.23 from 137.93 in Sept, while the rural tele-density increased to 41.27 from previous 40.96. – Urban mobile subscriber share stands at 59.65% as compared 40.35% of rural subscribers. – 2.30 million new Mobile portability requests were made in month of Oct 2013, taking the total tally of MNP requests since launch to 104.79 mln. 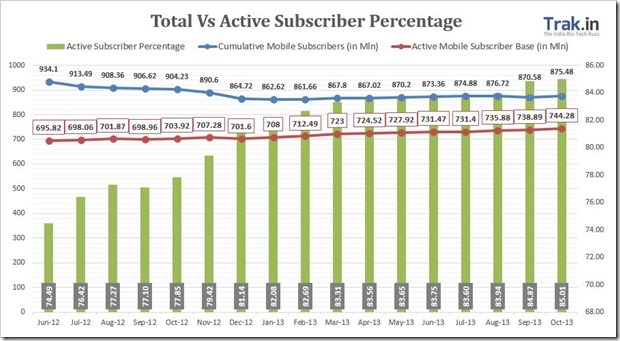 – Active Mobile Subscriber base increased from 738.89 mln in Sept 2013 to 744.28 mln in Oct 2013 taking the active percentage to 84.87 percent. – Wireline Broadband (> 512 Kbps) subscription reached 14.91 million in October 2013. – Wireline Subscriber base fell to 29.08 mln in Oct 2013 as compared to previously 29.28 million. – India’s total telecom subscriber base (wireless+wireline) has increased to 904.56 mln in Oct 2013, compared to 899.86 mln in Sept 2013. Bharti added 1.48 million new mobile subscribers, followed by Vodafone (1.15 ml) and Idea (1.14mln), while MTNL was biggest loser with 165k mobile users going out of their network. Tata continued its losing streak and now has fallen below Aircel in terms of market share.